Father's Day might always be a tricky holiday for Woody Allen but this year was particularly awkward. 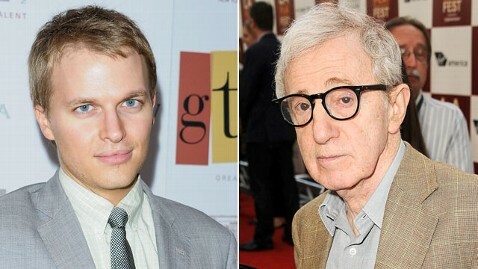 Ronan Farrow, the 24-year-old son of Mia Farrow and Woody Allen, let loose yesterday tweeting, "Happy father's day - or as they call it in my family, happy brother-in-law's day." Mia Farrow even got in on the act, re-tweeting his message and adding her own comment: "BOOM." Woody and Ronan have been estranged for years since his parents split and because Woody was dating (and later married) Soon-Yi Previn, Mia's adopted daughter, Ronan's step-sister. He has been quoted in the past as saying, "He's my father married to my sister. That makes me his son and his brother-in-law. That is such a moral transgression." Soon-Yi has said that she never considered Allen her father or even a father figure, noting that Andre Previn, Farrow's former husband was her adoptive father. Ronan, named Satchel Ronan O'Sullivan Farrow when he was born in 1987, is the sole biological child of Woody and actress Mia Farrow. He is currently serving as special adviser to the Secretary of State for Global Youth Issues and director of the State Department's Global Youth Issues office.